Are you looking for something to bring fun and energy to your sessions? Something more than “therapy as usual” that will have your clients eager to engage in the therapeutic process? Tai Chi does much more than create a relaxed state of body and mind – a growing body of research supports that its combination of gentle and adaptable exercise, breath awareness, and focus offers a host of benefits for improved mental and physical health. Tai Chi can help reduce stress and anxiety, alleviate depression, curb our cravings, and alter our perception of pain. But you’re hesitant to jump in, concerned that incorporating Tai Chi into your clinical practice will be too time intensive, too complicated to learn, and too difficult to introduce to your clients. Stop worrying and start moving! 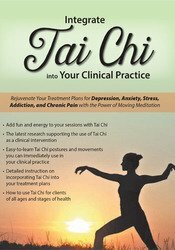 In this unique and experiential recording, you’ll quickly learn the basic skills of Tai Chi and discover how to incorporate it into your treatment plans for depression, anxiety, stress, addictive cravings, and chronic pain. And you won’t be spending your day in a chair! This recording will get you up and moving while you learn. No previous knowledge or background in Tai Chi is required to take full advantage of this recording. You will receive detailed instruction on the practice of specific Tai Chi postures and movements, as well as strategies to introduce them to your clients so they can get started right away. Your instructor will connect the dots between the practices of Tai Chi, meditation, and Cognitive Behavioral Therapy and demonstrate the techniques most appropriate for the disorders you see in clients each day. Discover how you can use Tai Chi to add fun and energy to your sessions, engage your clients, and focus them on the path to healing and change. 4 easy ways to use Tai Chi to relieve symptoms of depression. Powerful techniques to anchor attention and reduce stress with meditative movement. Effective methods to combine Tai Chi with CBT to disengage clients from the automatic thoughts and triggers that fuel their addictions. Guided exercises that are adaptable for clients of all ages and stages of health. Featuring demonstrations and guided experiential exercises, this seminar will have you feeling confident and prepared to bring Tai Chi into your clinical practice. Better still, you’ll be wholly engaged in what you learn during the recording and finish feeling more relaxed, more attentive, and more energetic! Analyze research on Tai Chi’s impact on depression and anxiety and articulate what this means for its use in clinical practice. Model the postures and movements of Tai Chi to guide clients in a moving meditation practice. Establish the role of the Vagus nerve in reducing anxiety and communicate how Tai Chi can be used in-session to stimulate it. Incorporate Tai Chi movements with meditation techniques to anchor the attention of stressed clients. Articulate how Tai Chi can be individualized for physically limited clients and communicate how these modifications can promote more effective participation in therapy. Characterize how clinical tools that increase self-awareness can be used in therapy to help clients better manage their thoughts, emotions, and behaviors. Dr. Elizabeth Nyang, Ed.D., M.A., LCPC, is a licensed counselor and certified Tai Chi instructor who works with clients dealing with mood disorders, life issues, and addictions. She uses mindfulness and Tai Chi techniques to help them reduce stress and gain insight into their problems. Dr. Nyang also accepts clients in need of treatment for alcohol and drug addiction and works with them in a special program that includes group and individual counseling to help them build a plan to get in and stay in recover. A longtime student of meditation, Dr. Nyang spent one year learning walking and sitting meditation at a Buddhist Temple. She earned her master’s degree in counseling from Seaton Hall University and her doctorate degree in counseling education from the American School of Professional Psychology at Argosy University. Financial: Elizabeth Nyang is in private practice. She receives a speaking honorarium from PESI, Inc. Non-financial: Elizabeth Nyang is a member of the American Counseling Association; and the Maryland Counseling Association. PESI, Inc. is an AOTA Approved Provider of continuing education. Provider #: 3322. This self-study course qualifies for 6.0 self-study contact hours or .6 CEUs in the Category of Domain of OT and Occupational Therapy Process. The assignment of AOTA CEUs does not imply endorsement of specific course content, products, or clinical procedures by AOTA. Course Level: Intermediate. Expires: 5/15/2020.